The Hoosac Water Quality District (HWQD) was formed under the 1970 Act of the Commonwealth of Massachusetts Chapter 21, Section 29 for the purpose of building, maintaining, and operating a system of sewage collection, treatment, and disposal for its two member communities, the City of North Adams and the Town of Williamstown, MA.Residents in the Town of Clarksburg are served through an intermunicipal agreement with the City of North Adams. The HWQD owns and operates a wastewater treatment facility (WWTF) located at 667 Simonds Road in Williamstown.In addition, the HWQD owns and operates a 19,000-foot long interceptor sewer consisting of 30-inch to 48-inch diameter pipes that originates in the City of North Adams, and conveys wastewater from North Adams and Williamstown to the HWQD's wastewater treatment facility.Today, the HWQD serves an estimated population of 25,500, residing in the sewered areas of North Adams, Williamstown, and Clarksburg. The HWQD's treatment facility is the only centralized treatment facility that serves North Adams ,Williamstown and parts of Clarksburg.The HWQD's WWTF is located at the site of Williamstown's original WWTF, which was constructed in the mid-1960s.When the HWQD was established in the mid-1970s to provide wastewater treatment capacity for North Adams and Williamstown, the HWQD acquired the Town's WWTF and upgraded it to secondary treatment standards with an increased average design flow of 5.37 MGD, until recently in February 2008 ,the facility was upgraded to the current design flow of 6.5 MGD, with a peak capacity of 18 MGD. 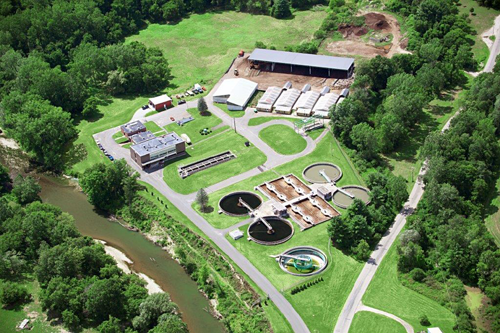 The HWQD's WWTF is a conventional secondary treatment facility that uses the activated sludge process to treat wastewater prior to discharge to the Hoosic River.The major liquid treatment unit processes include influent pumping and screening, grit removal, primary clarification, aeration, secondary clarification, disinfection via chlorination, and dechlorination. The solids handling process consists of sludge co-settled in the primary clarifiers, dewatered using belt filter presses, and then composted using the aerated static pile process to produce a reusable biosolids product.